Using "near Manila" is really hard to define; can eight to ten hours land travel be considered as near? Well, travel time are just numbers, for sure, you will be rewarded with a remarkable experience and spectacular and world class tourist spots. I listed down these stunningly beautiful islands we visited from January to June 2018 and it's up to you to see and experience how gorgeous they are. 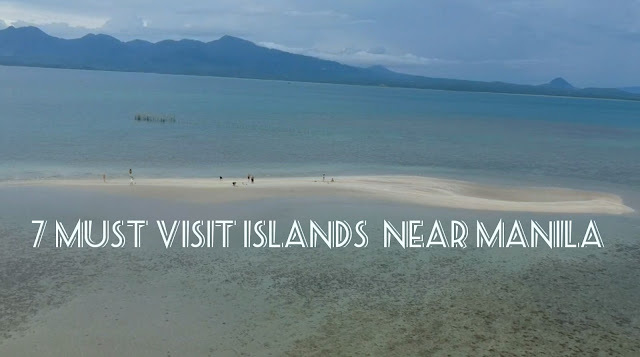 Apuao Island is situated in Mercedes, province of Camarines Norte, an 8 to 9 hours land travel from Manila and another 15 to 30 minutes boat ride to the island. It's better to take a rest while on the road because when you're on the island, you will definitely be busy enjoying its wealthy surroundings. Apuao has a long stretch and shapeless white sand shoreline. The white powdery sand has a mixture of shells, pebbles, and other crustaceans running back and forth. This island cannot be completed without a cool sea breeze and crystal clear waters. If you prefer an overnight, no worries cottages or camping by the beach are the choices. Sari-sari store, toilet and baths are available in the island. If you love island hopping, Apuao is highly recommended because it is just one of the Mercedes group of islands. You can also visit Malasugui Sandbar (drone shot above), Canimog Lighthouse, and Caringo Island. Southern Luzon has a lot to offer and Maniwaya Island is just one of them. This small island is one of the must visit destinations in Marinduque because of its amazing landscape, fine and powdery while sand beaches, crystal clear water, and its wide shoreline, perfect for sun bathing and other beach acivities. While on the boat, a vast diversity of underwater creatures are visible. Aside from the beauty of Maniwaya, Palad Sandbar and Ungab Rock Formations are other spots which are also Instagram worthy. You have an option between staying on resorts luxury rooms, cottages or camping by the beach. Forty five minutes from Boracay is Carabao Island, one of the stunning islands of Romblon. Indeed, this island has the same feature as its neighbor island. Its shoreline has a fine, white and powdery sand that give bright reflection of the sun rays while the leaves of the palm trees are gracefully swaying because of the cool sea breeze. Picnic by the beach is just perfect because of the tranquility and the relaxing ambiance. 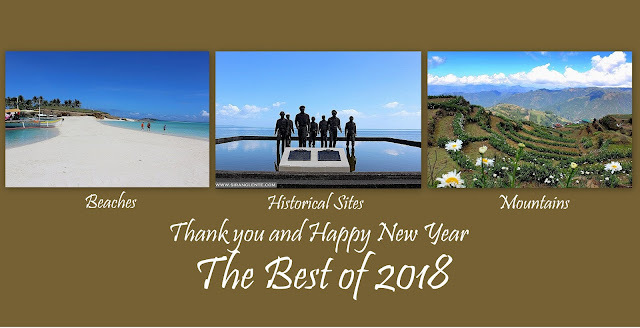 Other breathtaking spots to visit in the province are Binucot Beach in the Municipality of Ferrol, Lapus-lapus Cove in Tablas, the world class Bon-Bon Beach in Romblon island and one of the gorgeous sandbar in the Philippines - Cresta de Gallo in Sibuyan Island. Accessible via Batangas Port to Romblon, Romblon or Odiongan Port in Tablas Island. Via air, Manila to Tugdan Airport in Tablas island. Another unrated island can be found in Quezon Province; they call it Alibijaban Island. It is a tourist island situated in San Andres, Quezon; a 9 to 10 hours travel from Manila. The island is surrounded by a cool and transparent emerald water; its shoreline is made of fine white sand, a perfect paradise for the small living crustaceans; the beach has quaint cottages, boats and trees that serve as a perfect backdrop. While its underwater is rich with splendid flora and fauna that are visible because of the clear waters. How to Get Here: Superlines bus has a route to San Andres; alight in San Andres Public Market. Then, a 15 to 20 minutes walk to San Andres Port. Contact: Ate Baby - 09300123620. Where to Stay: There are cottages for rent, camping by the beach recommended or the locals accept overnight stay at their houses. The small but a scenic Tinalisayan Island is one of the main islets of Burias Group of Islands; 3 hours boat ride from Alibijaban. What's unique here is the stretch of fine white sand mixed with white pebbles while on the other side are the artistic stone balancing that are just picture perfect! There are palm trees surrounding the islet, with benches and cottages that are available for rent. Overnight camping are allowed. Toilet and Bath are available. Again, the waters are just ultra super mega clear, as in super! 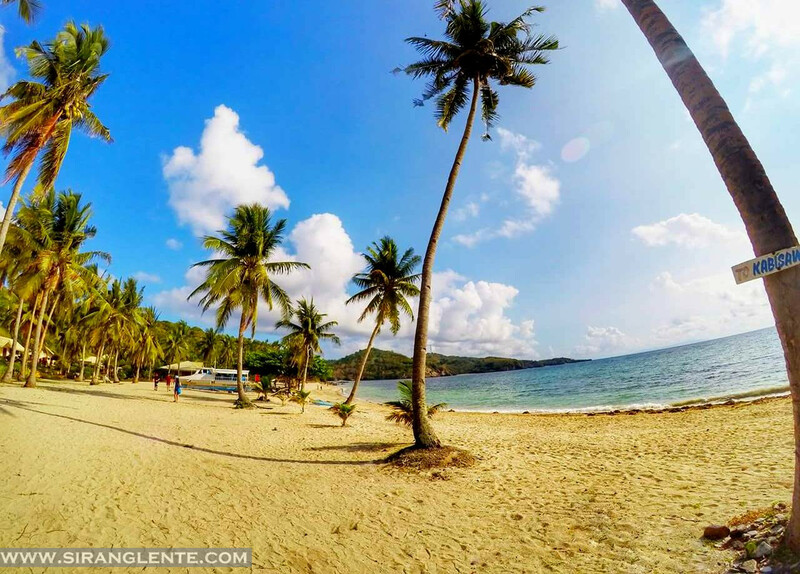 Sombrero island is one of the sun drenched islands in Burias, Masbate; still accessible from Alibijaban. This island is surrounded with water that has a distinct smell, similar to a watermelon or a cucumber; I just can't explain why. Its shoreline is wider compared to Tinalisayan but they both have white powdery sand. Among the Burias islands, it is the most visited, which means more people because of its beauty. Camping by the beach, cottages for rent, sari-sari stores, toilet and baths are available. Lastly, the photo perfect Animasola Island, also one of the Burias islands. Animasola has a different feature compared to the first six islands. It has no white powdery sand, no palm tress, and no crustaceans because of its gray pebbles because the entire islet is a gigantic rock perched into the water. The side or the walls of this islet has an amazing architecture, naturally curved by the nature. There are different shapes, lines and colors. The photo above is its amazing feature where the visitors can take a pose on top of the prominent boulder. Perfect article! Now we know where to go. Can't wait for more articles on this blog. you place too make this sort of magnificent informative site. don't recognise about. You managed to hit the nail upon the highest and also outlined out the whole thing with no need side effect , other folks can take a signal. is simply nice and that i could think you're a professional on this subject. My relatives always say that I am killing my time here at web, but I know I am getting familiarity everyday by reading thes nice articles. Pretty component of content. I simply stumbled upon your weblog and in accession capital to say that I get actually enjoyed account your weblog posts. am visiting this web site dailly and take good data from here everyday.